Consumers have until Jan. 31 to sign up for a health plan for 2016 coverage. People who do not have a health plan for 2016 face a penalty on their taxes of 2.5 percent of their income or $695 per person, whichever is higher. Read more about the tax penalty. If you are still looking for a health plan, you check our state’s health insurance exchange, Washington Healthplanfinder to find out if you qualify for financial help, including tax credits that may lower the cost of coverage. If you do not qualify for help with your health insurance, you can contact an insurance agent or broker directly to find out what your plan options are. You can look at the 2016 individual plans and rates on our website. Read some tips from us about things you should consider when shopping for a health plan. After Jan. 31, you’ll have to qualify for a special enrollment period to sign up or make a change to your plan, or wait until the 2017 open enrollment period. 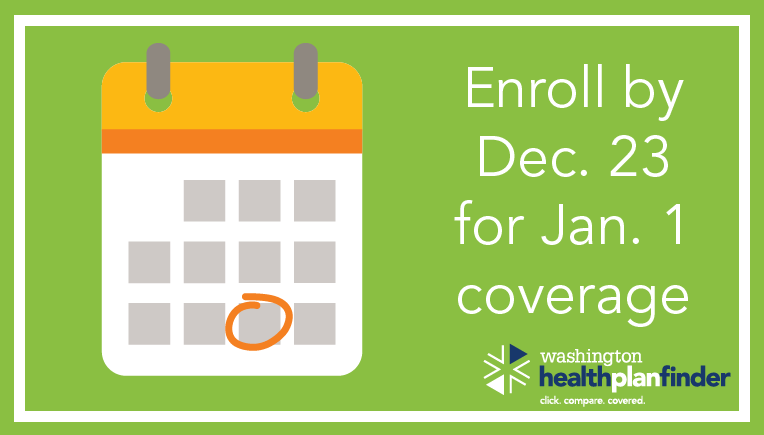 Consumers have until Dec. 23 to sign up for a health plan through Washington Health Benefit Exchange for coverage that begins on Jan. 1. The last day to get health insurance for 2016 is Jan. 31. People who do not have a health plan for 2016 face a penalty on their taxes of 2.5 percent of their income or $695 per person, whichever is higher. Read more about the tax penalty. If you are still looking for a health plan, you can look for one at our state’s health insurance exchange, Washington Healthplanfinder and find out if you qualify for financial help, including tax credits that may lower the cost of coverage. If you do not qualify for help with your health insurance, you can contact an insurance agent or broker to find out what your plan options are. Read some tips from our office about things you should consider when shopping for a health plan. The Federal Aviation Administration (FAA) estimates more than one million drones will be sold this holiday season. Everyone from photographers and farmers to law enforcement and hobbyists are using drones. Whether for personal or commercial use, there are a number of insurance issues to consider ranging from personal injury and property damage to privacy concerns. Drones present a significant risk to property and life on the ground in the event of an accident. Drones can crash due to faulty and inappropriate operation, mechanical defects and component failure. Losses and damages could involve bodily injury to humans and animals as well as buildings and structures. Using a private drone as a hobby is generally covered under a homeowner’s insurance policy—and subject to a deductible--which typically covers radio-controlled model aircraft. This also applies to a renter's insurance policy. Look at the contents section of your policy, or talk to your agent to see if your drone will be covered if it is lost, stolen or damaged. If your drone falls onto your car, damage to your car may be covered if you have a comprehensive coverage auto policy. A larger concern is liability for an accident caused by your drone. If your drone crashes into someone else's vehicle or a person. 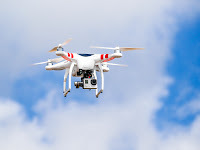 If you have a homeowner’s or renter's policy, generally the policy will cover liability for an accident caused by your drone if it is determined that you were negligent and at fault. Check with your agent or insurer to verify your policy contains this important coverage. You can also read a story about drone insurance that was recently posted on the Insurance Journal’s website. Don't fly higher than 400 feet and stay clear of surrounding obstacles. Keep the aircraft in sight at all times. Stay away from manned aircraft operations. Don't fly within five miles of an airport unless you contact the airport and control tower before flying. Avoid flying near people or stadiums. Don't fly an aircraft that weighs more than 55 pounds. Use caution when flying your unmanned aircraft. With some drones weighing up to 55 pounds, a fall from the sky can cause significant damage to property or bystanders. Recently, federal regulators announced that recreational drone operators will soon need to register their aircraft. This will allow authorities to trace a drone back to the owner, which means it's vital that you're in compliance with laws and regulations and have the appropriate insurance coverage.